The lens equation relates the object distance, the image distance and the focal length: we derive that equation here. A converging lens brings rays together at the focus, as at right, and can make either real or virtual images. A diverging lens is usually used to produce virtual images. This page supports the multimedia tutorial Geometrical Optics. Light rays refract at the interface between glass and air according to Snell's law. If the lenses are thin, the curved surfaces are often spherical, because this shape is easier to grind. In the multimedia tutorial Geometrical Optics, we made a ray diagram using rays of light. Below we show just a schematic, so that we can label the geometry and use it to derive the lens equation, i.e. we shall relate object distance do, image distance di and focal length f.
To start, we locate the bottom of the object on the optical axis of the lens, as shown, a distance do from the lens. A ray on the axis is undeflected, so the base of the image will also lie on that line. From the top of the object (height ho), we take one ray through the centre of the lens. This ray too is undeflected by the lens. Then we take a ray from the top of the object and parallel to the axis of the lens. By definition of the focus, this ray is refracted to pass through the focus. The top of the image is located where this ray intersects the other ray from the same point on the object. The intersection point determines both the image distance di and the image height hi. hi/ho = (di − f)/f . If we replace this converging lens with a converging (ie concave) mirror, facing right, then the object would have to be on the right, and the rest of the diagram could be the same. So this equation works for lenses, too. In more complicated examples involving two or more lenses, mirrors or combinations, it is helpful to use a cartesian convention for the distances and heights involved. In this experiment, an incandescent light bulb (foreground) is the object, from which light is focussed by the lens to form an image on the white screen (top left). Only a small fraction of the light from the bulb passes through the lens, so the image is not nearly as bright as the object, for this reason, we have . However, the image of the hot wire element of the bulb is clear. The image is real (light really does arrive on the screen to create it) and inverted. (The black cloth on the floor is to stop light reflected from the floor onto the screen. In terms of this plot, the lens equation is y = (slope)x + (intercept), so the slope is −1 and the intercept is 1/(focal length). For this lens, we obtain a focal length of 20 cm. The next photo (thanks NASA) is out of this world. 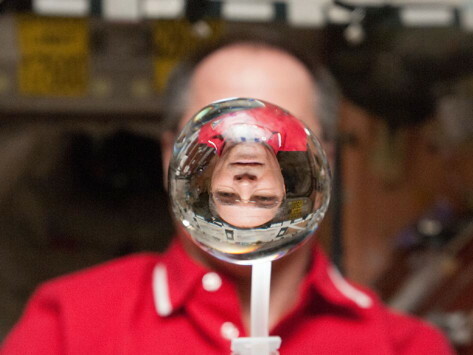 Taken on the International Space Station, using an approximately spherical mass of water as a converging lens, it shows an inverted image of astronaut Kevin Ford. I suspect that the white objects at the bottom of the photo are a drinking straw and bottle. The surface tension of water is about 70 mN/m so, if the perimeter of the globe is about 0.2 m, the attractive force around that perimeter is only about 10 mN, constraining a mass of about 0.1 kg. We have seen in Oscillations that this force can set up three dimensional vibrations.